Far from the traditional stereotype of spotty teenagers, acne is one of the most common skin complaints experienced by men and women of all ages. Acne is typically associated with a vision of angry looking boils and marks that cover the face, neck, chest and back but it can take many forms. Whiteheads, small pimples and blackheads are also forms of acne. The body is made up of billions of skin cells which all go through a natural life cycle. Skin cells are ‘born’ deep in the dermal layer, long before they become visible. The constant cycle ends with skin cells dying and shedding at a rate of between 30 and 40,000 cells per day. In the dermal layer, individual hair follicles are attached to sebaceous glands. These glands produce sebum which is an oily substance that helps carry the dead skin cells to the surface of the skin where they fall away to make way for the new cells. All cases of acne are a result of excess oil in the sebaceous gland. The combination of excess oil and dead skin cells can lead to blockages in the hair follicles which causes the spots. Throw possible bacterial invaders into the mix, and you have angry and inflamed pimples, spots, or as we know it better; acne. Teenagers are traditionally more susceptible to acne because the sebaceous glands start working and producing oil during puberty. One of the primary hormones responsible for acne is the androgen we know as testosterone. If a woman is sensitive to the traditionally male hormone, the sebaceous glands will produce more oil than is necessary. While acne isn’t exclusively a condition for women, women go through regular hormone changes during their life making them more susceptible at various stages of the monthly cycle. During menstruation, ovulation, menopause, breastfeeding and pregnancy; a woman’s testosterone levels fluctuate which can lead to ‘part-time’ acne. Testosterone is the traditionally male hormone which is consistently present meaning a male is less likely to experience regular fluctuations to their skin, as women do. Allergies or intolerances to food or food groups are treated as an invader with the body working overtime to get rid of the threat. This can cause inflammation of the skin which shows as pimples and in some severe cases of intolerance, extreme acne. Greasy foods high in toxins can also cause breakouts as the toxins are released through the skin pores causing inflammation. It’s important to note that unless the underlying causes of acne are addressed, such as removing intolerant foods from the diet, or treating hormone imbalances, any recommendations to prevent and treat acne will only reduce the size of the blemishes rather than provide a complete cure. A gentle exfoliator will reduce the build-up of dead skin cells, bacteria and excess oil to keep the pores clear. Our Bd serum is an enzyme exfoliator that leaves skin fresh and glowing. Its anti-oxidising properties will also reduce redness and inflammation without the harsh scrubbing required from manual exfoliators. The tartaric acid in Bd is a powerful natural enzyme exfoliator which will also cleanse away excess oil. Bk serum is pure extract of Kakadu Plum and rich in phyto chemicals which have anti-fungal, anti-viral and anti-inflammatory properties to treat and heal inflamed skin. Acne caused by excess oil or dirt is easier to prevent and treat than acne caused by internal stresses. Bk serum contains ellagic acid which is a powerful antioxidant that flushes out toxins to help clear pimple-causing bacteria from the skin. 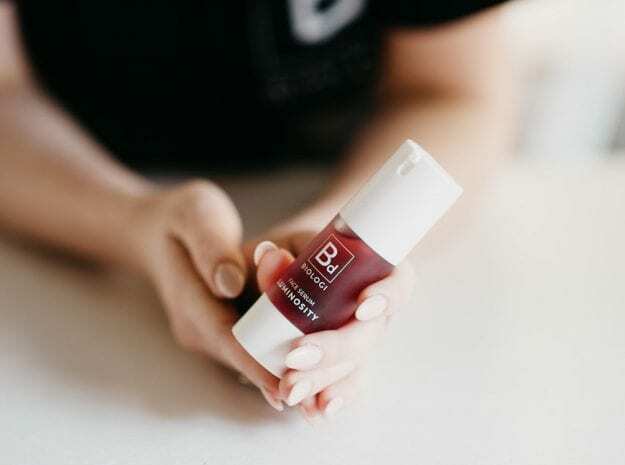 Bf serum interrupts keratinisation (the process that creates a barrier that holds dead skin cells together) to further reduce the oil build up that leads to acne. Acne is often the result of skin irritated by harsh chemicals applied to the skin topically. Even if a label states that a product is suitable for sensitive skin, or ‘natural’ or ‘organic’, it’s likely it will contain activating and stabilising ingredients that may cause a reaction in delicate skin. Regardless of the ingredients, traditionally creamy moisturisers can also block pores leading to further breakouts. All Biologi serums are 100% plant extract. They’re 100% active, so they don’t require any synthetic ingredients to make them work. A unique airless pump container means they don’t become exposed to air, eliminating the need for chemical stabilisers. The water-based consistency also reduces the likelihood of blockages in pores resulting in acne. The only genuine cure for acne is to address internal imbalances, and anyone that tells you otherwise isn’t speaking the truth. Addressing internal causes combined with regular use of Biologi serums will reduce inflammation and redness, clear pores and gently sweep away excess oil to reduce the incidences of acne.